I’d been bumping into Jackie and Sarah from Marsh Pig Salami at farmers’ markets and food fairs for a while and I’d tried their award-winning products and liked them. 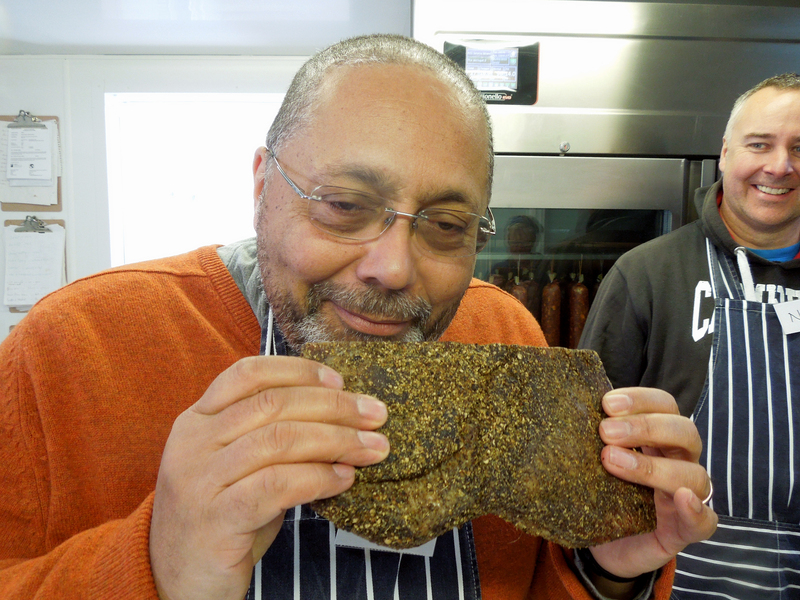 Then I noticed a tweet from Jackie talking about their curing and smoking course. They had a curing and smoking course? I wanted to be on it. A bit of wheedling and hint-dropping later and we had two places booked, a combination of Christmas and birthday presents from generous family members (though the alluring prospect of home cured and smoked bacon may have played a part in their decision-making). It’s the best birthday present I’ve had in years. 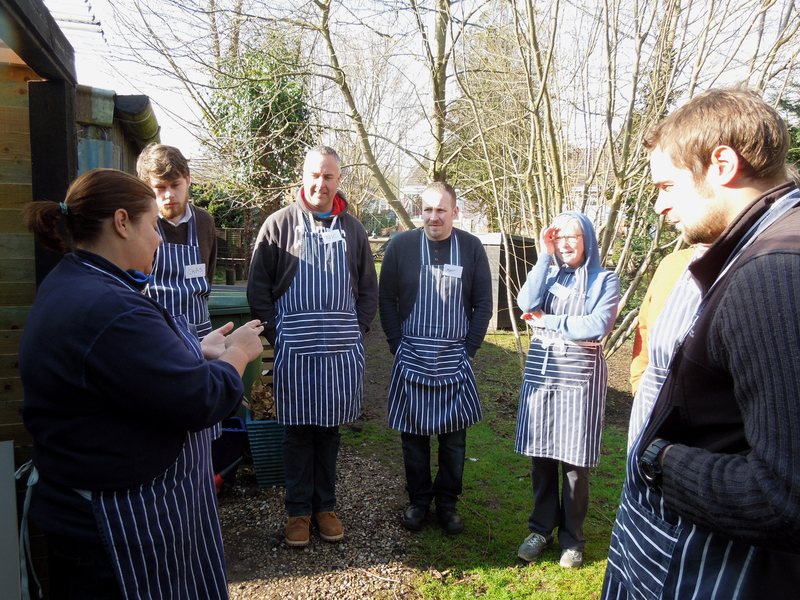 We assembled at Marsh Pig HQ in Norfolk on a cold, bright February day to be greeted with hot tea and coffee and the promise of an imminent bacon bap. We put on our pinnies, rolled up our sleeves and made bacon, sausages and salami to take home. In between feeding us breakfast and a generous lunch, Jackie also talked us through methods and recipes for pancetta, coppa, biltong and jerky, how to cold smoke and how to hot smoke, before sending us home with our goodies and a comprehensive recipe booklet. It was an enormously informative and entertaining day and one of the best food courses I’ve been on. We were a motley crew: our friendly eight-person group included Matt the butcher and Nic, who sells Big Green Egg barbecues and smokers. The only other woman was Alix, who’d pedalled in from just up the road. Curing and smoking seems to be a Man Thing, so it was pleasing to have a woman instructor imparting her hard-earned wisdom. And it is hard-earned. Jackie worked as a head hunter in banking for years but she’d originally trained as a cordon bleu chef and wanted to return to something creative and food-related. It was a toss-up, she says, between charcuterie and cheese making and the charcuterie won. But she didn’t get much help when she started out. So Jackie got stuck in and, through trial and error and by dint of a lot of 18 hour days and an £80 thousand outlay on equipment, she has forged a successful business. She only uses rare breed, free range, British meat. Free range because it’s ethical and rare breed because she says it’s slow-maturing and tastes better. That commitment to quality has paid off. 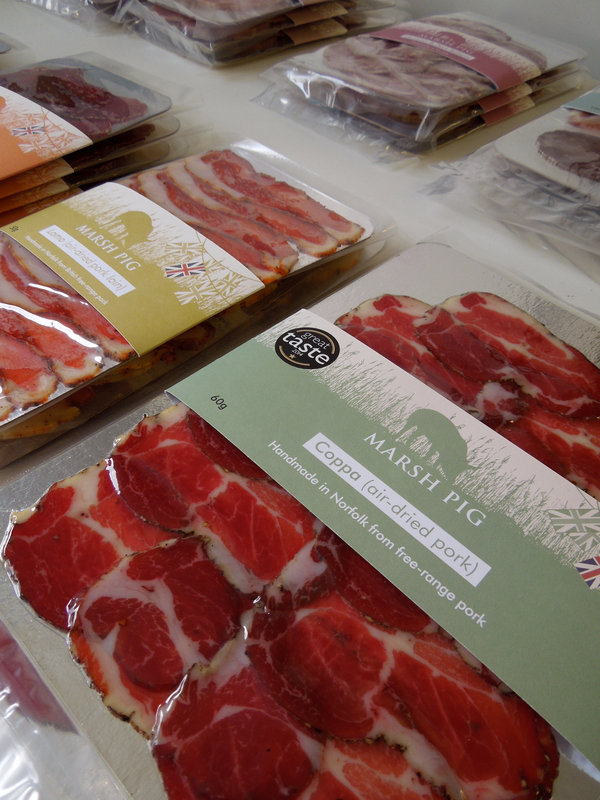 Two and a half years later the business is in profit and Marsh Pig Salami has made a name for itself. My bet’s on Marsh Pig scoring another winner. We came home clutching our packages of bacon, sausages and salami. The salami is still curing but we smoked the bacon and tried both that and the sausages. The bacon in particular is a revelation. I don’t think we’ll ever go back to buying shop-bought and it galvanised Him Outdoors into finishing our half-built cold smoker. So now, thanks to Jackie and Sarah, we’ll be pigging out on our home-made products for years to come. This entry was posted in Pork, ham and bacon, Producers, Smoking and curing and tagged charcuterie, home curing, Home smoking, Jackie Kennedy, making bacon, making salami, making sausages, Marsh Pig Salami by Linda Duffin. Bookmark the permalink. A Wendy smoker? 😀 Home smoked bacon incoming – you can judge for yourself. The course was brilliant and a pleasure to share it with you. My salami reached the required weight so I tucked in today and it’s lovely. Since the course I’ve smoked 4.5Kg more bacon, started some coppa, bought and used a dehydrator to make amazing jerky, smoked some cheese and salmon and generally enthused to anyone that will listen. Three friends have all now bought dehydrators to make their own jerky and the local butchers must be wondering what the run is on all of the salmon cut beef. We’re off to the beach soon so I will be experimenting with hot smoked oysters in the Big Green Egg. 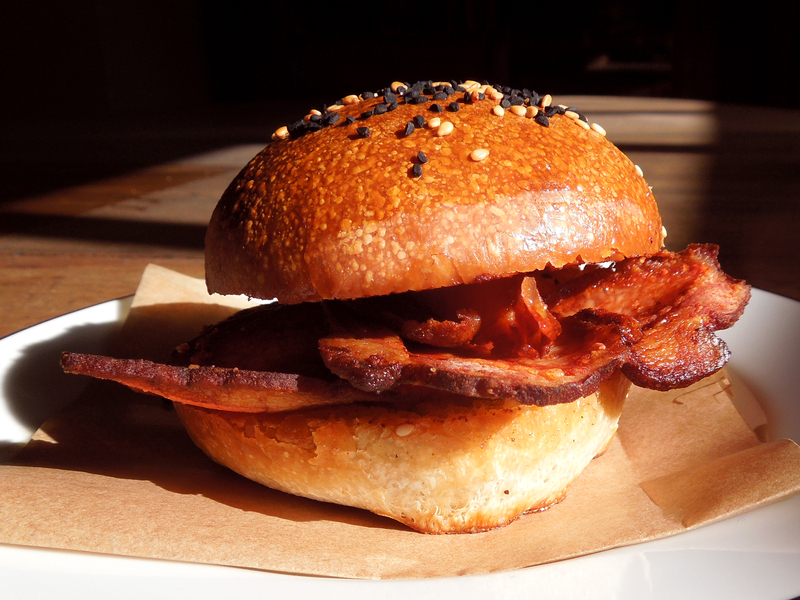 Of course we will be taking a lump of home smoked bacon for breakfast alfresco. 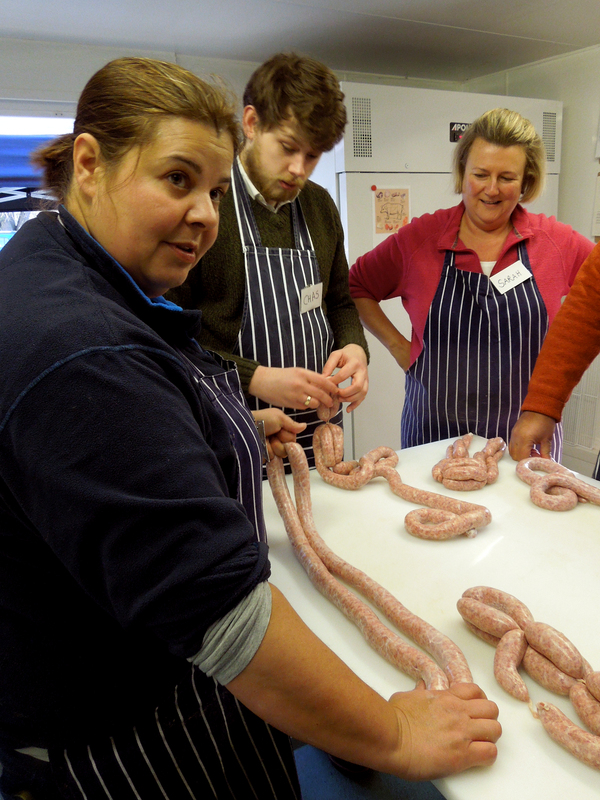 You’ve given me some impetus to get involved in an occasional course near here on sausage making. We’re talking bangers, but good ones. Onre step at a time, eh? Heck, yes, you can’t beat a good banger. Do give it a go, it’s really good fun making your own and so satisfying to put on the table something you’ve made from scratch. Please report back! Update: we’ve tried the salami and it’s sensational, quite as good as any you could buy and better than many. 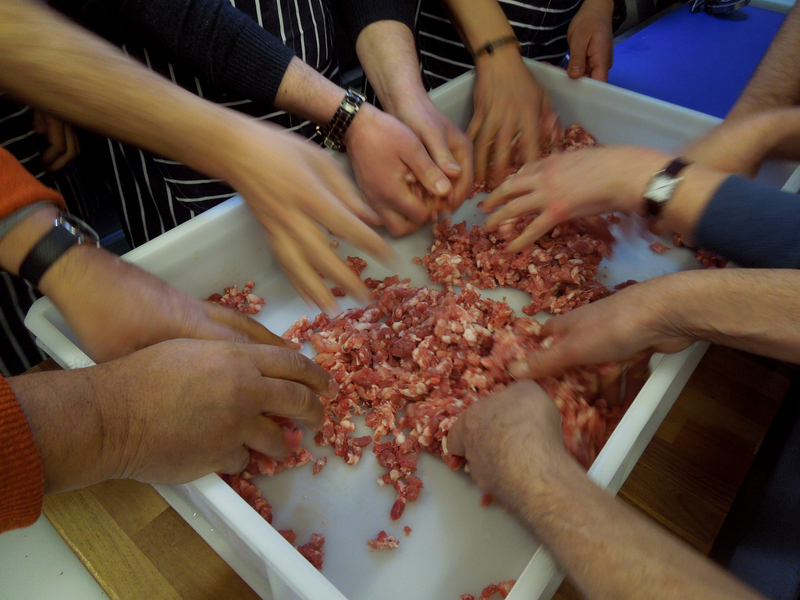 We’ll be making much more of it and doing a share with friends who’ve donated rare breed pork (thanks Karon and Simon).